Amazon.com Price: $18.99 (as of 2019-04-22 14:23:13 GMT) Product prices and availability are accurate as of the date/time indicated and are subject to change. Any price and availability information displayed on Amazon.com at the time of purchase will apply to the purchase of this product. 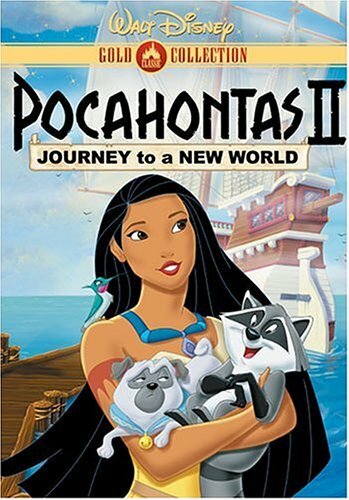 All the magic of Disney’s Academy Award(R)-winning film POCAHONTAS (Best Original Song, 1995) continues in a fun-filled adventure that finds Pocahontas setting sail for an exciting new world, England. With her comical companions Flit, Meeko, and Percy, along for the ride, this spectacular film promises plenty of thrills and laughter for everyone. As an ambassador of peace, Pocahontas is swept away by London’s “curious” customs. Attempting to fit in, she makes friends with the dashing English diplomat John Rolfe, and Mrs. Jenkins, his lovable housemaid, both of whom help Pocahontas prepare for her debut at the celebrated Hunt Ball. There, she must convince the King of England that her people are truly civilized in order to stop an armada moving against them. Pocahontas soon finds herself at odds with the scheming Ratcliffe, but when a mysterious stranger comes to her rescue, the courageous Pocahontas must choose between the love of her past … and the path to her future. Told through brilliant Disney animation, five incredible new songs, and unforgettable characters, POCAHONTAS II: JOURNEY TO A NEW WORLD, is alive with all the colors of a Disney classic. Get a Free Book from Scholastic when you Purchase a Brita Bottle for Kids!